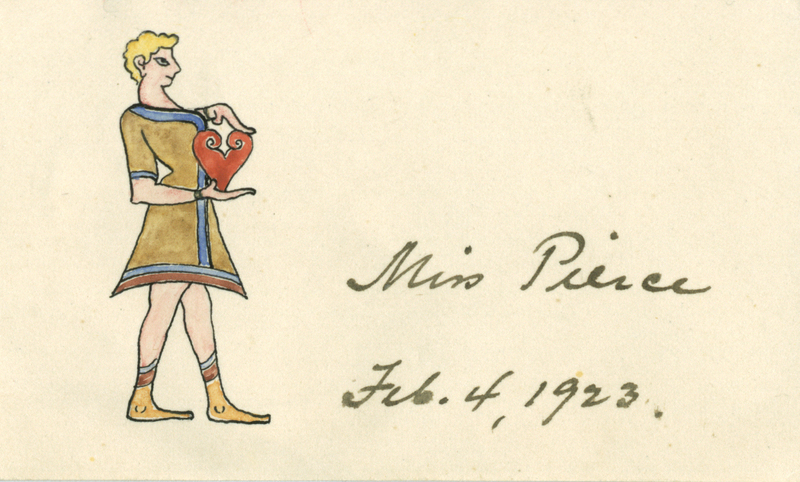 This little Valentine was included in a letter mailed from Athens to Rome in early February 1923. Carl Blegen, Secretary of the American School of Classical Studies at Athens, asked his friend and artist Piet de Jong to draw the Valentine for his beloved Elizabeth Pierce. The Bronze Age figure on the card alluded to his recent work with Alan Wace which argued that the Mycenaean culture of mainland Greece had nothing to do with Minoan colonization, as Sir Arthur Evans had believed, and should instead be called “Helladic.” The image certainly hits the mark. 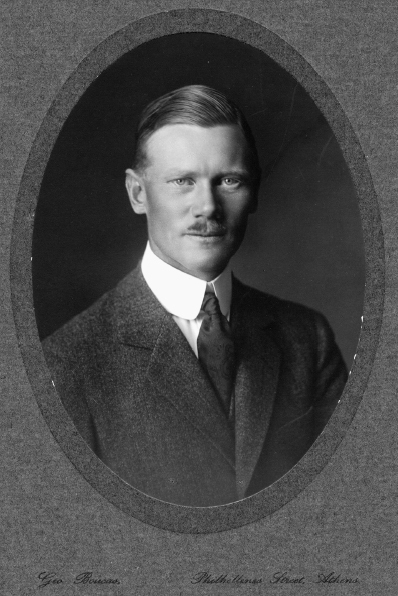 In the fall of 1922, Blegen, who was 36 years old, had met and fallen in love with the 35-year old Elizabeth D. Pierce, who had come to Athens to attend the School’s annual program. With a BA from Vassar College and a PhD from Columbia University, Libbie (as she was known to her friends) was then involved in a “Boston marriage,” with Ida Thallon, professor of Classics at Vassar College. Away from Ida’s influence, Libbie soon fell in love with Carl who reciprocated with equal fervor. On January 27th, he proposed to her just before she left for a long trip to Italy; Ida was going to join her soon. In “Carl and Elizabeth Blegen Remembered, 9 Ploutarchou Celebrated,” a colloquium that the American School co-organized with the J.F. Costopoulos Foundation in May 2013, Robert Pounder, Professor Emeritus at Vassar College, delivered a fascinating talk about the relationship of these three people who later became a foursome, when Ida married Bert Hodge Hill. They all lived in the neo-classical house on Ploutarchou 9 until their death (and they are all buried in the Protestant Corner of the First Cemetery of Athens). Back in February 1923, however, an enamored Carl could not have predicted how complicated his relationship with Elizabeth (Libbie) was soon going to be. Those who are not familiar with their story will have to wait for the publication of the colloquium’s papers which is under preparation. Robert Pounder has delivered a great story. Great Valentine, Natalia; thank you. J. You certainly are better informed than I am, so please correct me if I’m mistaken, but might the phrase, “Away from Ida’s influence…”, be a bit invidious? 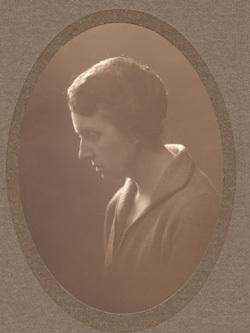 Elizabeth Blegen may well have transferred her affections from one person to another in the course of a dig season–stranger things have happened–but that doesn’t mean her relationship with Ida Thallon was not sincere or reciprocal, that she was simply “under the influence” of a dominating partner. After all, at least as I understand it, the Blegens never really settled into bourgeois heterosexual monogamy and would later share a house with Thallon and her husband. Thank you for your comment. I am afraid Ida was a bit controlling. Okay. I look forward to the publication, which I’m told will be coming soon. Thanks Natalia. The figure holding a heart has a warrior’s posture. Profound.